4:1 I have an important order for you. I’m giving it to you while God is watching. So is Jesus the Messiah, who will judge everyone—the living and the dead. He’ll do this when he comes back and brings his kingdom with him. 4:2 Preach God’s message. Do it whether or not people listen. With ultimate patience, confront the people with God’s message. Warn them. Teach them. 4:3 There’s going to come a time when folks won’t put up with honest teaching. They’ll want to hear what they want to hear. And they’ll round up plenty of teachers to tickle their ears. 4:4 People will turn their backs on the truth. They’ll turn their attention to meaningless myths. 4:5 But you, keep your head on straight. When evil comes to hurt you, suffer through it. Do your job as an evangelist: spread the word. Don’t stop until you’re done. 4:6 It’s time for me to leave this world. My life is already getting poured out like a cup of wine emptied on the altar, as a sacrifice to God. 4:7 I fought the good fight. I finished the race. I kept the faith. 4:8 I’ve got a reservation waiting for me: a crown of goodness. The Lord, the good judge, will give it to me on that special day. In fact, he’ll give a crown to everyone who looks forward to his coming. 4:9 Do the best you can to come and see me soon. 4:10 Demas1 deserted me. He cares too much about staying alive in this world. He went to Thessalonica.2 Crescens3went to Galatia,4 and Titus went to Dalmatia. 4:11 Luke 5is the only one still with me. Get Mark6 and bring him with you. He’s a big help in ministry. 4:14 Alexander the coppersmith hurt me terribly. The Lord will give him what he deserves for that. 4:16 When it came time for the preliminary hearing, no one stepped forward to defend me. Everyone deserted me. I don’t blame them, and I don’t want anyone else to blame them, either. 4:17 The Lord stood by me. He’s the one who gave me the strength I needed to finish the job of taking the message to non-Jews so that all of them might hear about it. He kept me safe from the lion while I did that. 4:20 Erastus13 stayed in Corinth and I left Trophimus behind in Miletus14 because he got sick. 4:21 Do your best to get here before winter. Eubulus15 says hello to you. So do Pudens, Linus, Claudia, and all of our spiritual family here. Demas was an associate of Paul’s mentioned in Colossians 4:14, Philemon 1:24. He was apparently the only one of the men Paul named in verses 10-11 who deserted him. The verb “deserted” applies only to him. The others simply left for other reasons, apparently to carry on the work Paul started. Thessalonica was a city in northern Greece. Paul started a church there and later wrote at least two letters to the congregation: 1, 2 Thessalonians. Galatia was a Roman province in what is now central Turkey. Paul wrote the book of Galatians to these people. But Galatia was also the name of territories in northern Italy and in what is now France, then called Gaul. Dalmatia was a region east of Rome, across the Adriatic Sea and north of Greece. Once a part of Yugoslavia, it’s in what is now Croatia. Luke was a physician who traveled with Paul (Colossians 4:14). Early church leaders credited him with writing about a fourth of the New Testament—the Gospel of Luke and its sequel, Acts. Mark was also known as John Mark. He was the son of Mary of Jerusalem (Acts 12:12) and the cousin of Barnabas (Acts 15:37; Colossians 4:10), Paul’s first mission partner. Troas was a city in northern Greece, about halfway between where Timothy probably was (in Ephesus) and where Paul likely was (in Rome). Literally “parchments.” Books written on the tanned hide of sheep and goats were more expensive than those written on paper-like papyrus books. Leather lasted longer and could be reused. Some Bible experts say Paul was referring to his trial, and reporting that Alexander served as a hostile witness against him. Paul worked with this couple as tentmakers in Corinth (Acts 18:2-3). They later traveled with him to Ephesus (Acts 18:18). Paul said Onesiphorus helped him while Paul was in chains (2 Timothy 1:16). Paul identified Erastus as an associate, in Acts 19:22. Miletus was a city on Turkey’s west coast, about a two-day walk south of Ephesus. The four people Paul mentions in this verse don’t show up anywhere else in the New Testament. Some Bible experts guess they were leaders Timothy knew in the church at Rome. In the first sentence, Paul seems to address Timothy. In the second sentence, Paul seems to address everyone else in the church, and perhaps those he hopes will read copies of this letter later. These are the last reported words of Paul. Church leaders writing in the decades that followed say he was beheaded in Rome. These closing words of his letter to Timothy represent the last wish of a dying man, written to what sounds like his closest friend, “the son I dearly love” (1:2). In reading Paul’s instructions, in 2 Timothy 4:2-5, what do you think would’ve been the most difficult thing for Paul to tell his friend to do? 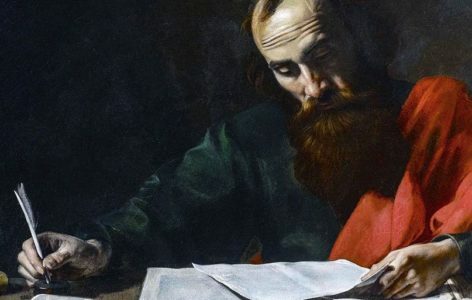 In an otherwise tender and deeply personal closing to this letter, Paul takes a jab at a man who doesn’t seem to show up anywhere else in Paul’s writings. “Alexander the coppersmith hurt me terribly. The Lord will give him what he deserves for that. Watch out for that man. He viciously argued against what I said” (2 Timothy 4:14-15). Perhaps Alexander was a hostile witness against him at Paul’s trial in Rome. Do you think Paul’s criticism of Alexander tarnishes the shimmer of Paul’s last goodbye, maybe just a little? LIFE APPLICATION. Paul warned Timothy “There’s going to come a time when folks won’t put up with honest teaching. They’ll want to hear what they want to hear. And they’ll round up plenty of teachers to tickle their ears” (4:3). Many people certainly do that regarding their political preferences. They will watch television broadcasts and listen to radio programs that reinforce the messages they want to hear, rather than listen to objective reporting that chases the truth wherever it leads. How do you think Christians might do that when it comes to matters of faith? LIFE APPLICATION. Facing death, Paul delivers one of the most poignant, powerful, and moving statements anywhere in the Bible. “I fought the good fight. I finished the race. I kept the faith” (4:7). Of the people you have known who have died, who fits that description? LIFE APPLICATION. In the last lines of Paul’s poetic goodbye, in 2 Timothy 4:6-8, he paints several compelling word pictures that we can easily see in our mind’s eye. Which word picture do you find most compelling? LIFE APPLICATION. As Paul wraps up his letter he tells Timothy “Do the best you can to come and see me soon” (4:9). Many people who have been around folks who were about to die can relate to this request. People who are dying usually want their loved ones close. And the people who are about to be left behind often do not want to leave the side of their loved one. Can you confirm that?